When we eat this pizza, I feel as though we are enjoying a gourmet pizza that took minutes to prepare. It happens to be a favorite of my 14-year-old son, who is usually all about pepperoni pizza! Typically, I love a good saucy pizza–meaning the tomato version. This white sauce, however, is quick, easy and really delicious. I also like that it is infinitely lighter and healthier than most Alfredo-type sauces available in a jar. As much as I like to make my own pizza crust, there are many excellent store bought options and they work beautifully and allow for big time savings. The one pictured above is a crust I found in the bakery section of our local grocery store and it was delicious. This white sauce can be whipped up in minutes and is much tastier and healthier than a typical jarred variety. Sometimes, I go a little heavier on the spinach or use kale. Sautéed mushrooms also compliment the flavors of this pizza beautifully. Heat olive oil in a medium saucepan over medium heat. Add garlic and cook for 30 seconds. Add flour and pepper and cook for 1 minute, stirring constantly. Spread the cheese mixture onto the pizza crust. Meanwhile, place the spinach is a small microwaveable bowl with about a teaspoon of water and cook for 30 seconds or until just wilted. Drain any excess liquid but there is no need to squeeze dry. Top the cheese mixture with the spinach, chicken and onion. Then sprinkle on the mozzarella cheese. 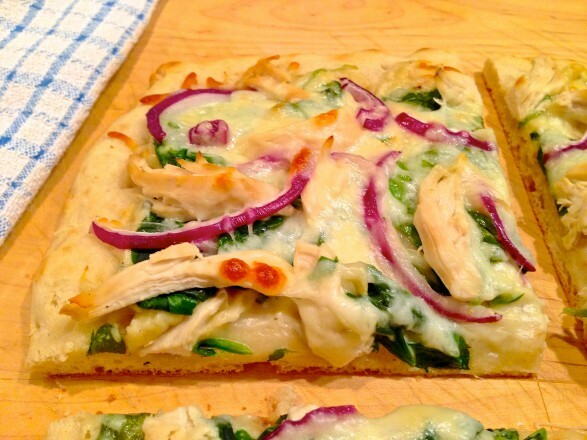 Bake on a pizza stone or baking sheet for 10 minutes or until the cheese is melted and bubbly and the crust is golden. If you prefer to use an uncooked pizza crust, simply bake the pizza for 15-20 minutes. 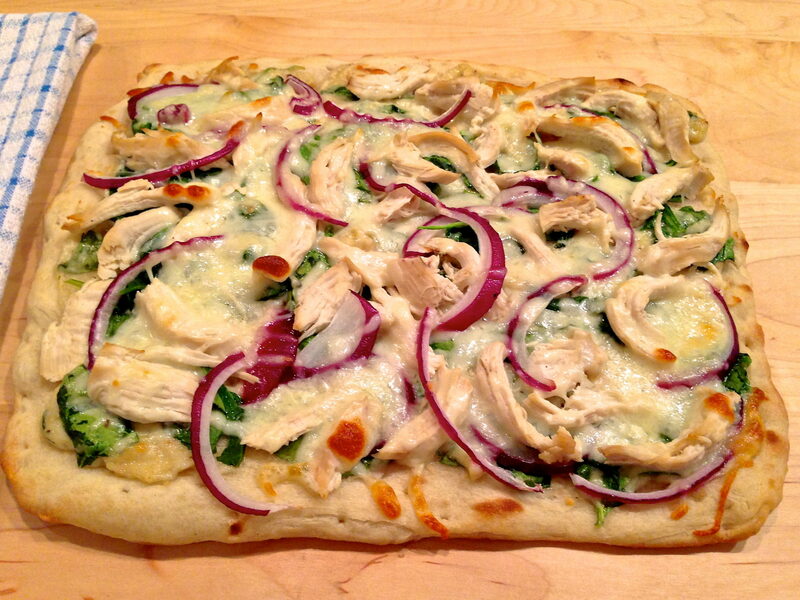 We had this for dinner this evening – it was a hit! A definite keeper. I used whole wheat store bought crust to save time. I only had frozen chicken -so, I thawed and pan browned with garlic. It was delicious. Thanks for the recipe! I am thrilled you enjoyed this and so appreciate the great feedback! I tried this recipe last night and it was great! Even Trevor liked it – and he can be a fussy eater at times. Thank YOU for such a thoughtful comment, Dianna. I truly appreciate when someone takes a moment to let me know they have cooked one of my recipes…when it is a keeper, all the better!! I make your chicken parmesan pizza probably once a week and your Greek pasta skillet all the time! My whole family loves it! Your supper looks much, much better than mine. I will definitely try this one. I agree your mornay sauce is superior to anything jarred — healthier and more flavorful. Also like baking the crust first to make it crustier. Thanks for sharing your ideas. You are welcome, Jean, and thank you for your thoughtful comments. I hope you enjoy!